I had to laugh at yesterday’s pig picture. Did you notice its name in the caption underneath? “Little Pudding”. What a great name for a pig. Especially THAT one. 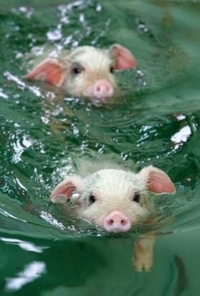 While we’re on the subject… today’s pig picture is thanks to an irresistable site called Cute Overload. Every day a gooey serving of calorie-free visual sweetness. You gotta check it out.